Actually if there are crop failures it is because of the cold and bad weather. And as far as the drought NASA’s Goddard Space Flight Center shows that precipitation — rain and snow — has increased slightly over the century. 3. “Arctic specialist Bernt Balchen says a general warming trend over the North Pole is melting the polar ice cap and may produce an ice-free Arctic Ocean by the year 2000.” Christian Science Monitor, June 8, 1972. In 2008 Dr. David Barber of Manitoba University said “We’re actually projecting this year that the North Pole may be free of ice for the first time,” (ignoring the many earlier times the Pole has been ice free). Actually Arctic Ice, is thicker and temperatures are not rising. 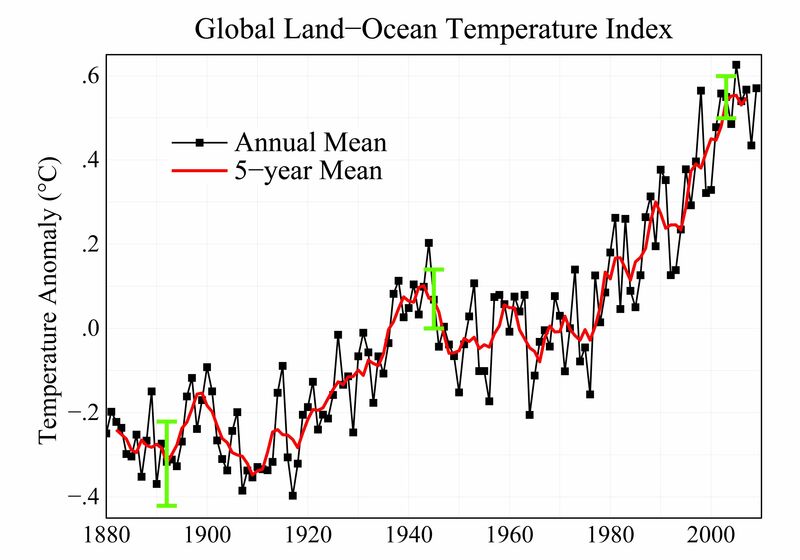 Status of prediction: According to NASA, global temperature has increased by about 0.7 degrees Fahrenheit since 1989. And U.S. temperature has increased even less over the same period. And thats the NASA numbers which have been known to have a problem accuracy, because instead of collecting data from temperature stations, NASA makes assumptions regarding what the temperatures should be. Life Magazine also noted that some people disagree, “but scientists have solid experimental and historical evidence to support each of the following predictions.” With the possible exception of the atmosphere directly over congress, air quality has actually improved since 1970. Studies find that sunlight reaching the Earth fell by somewhere between 3 and 5 percent over the period in question. 6. “If present trends continue, the world will be … eleven degrees colder by the year 2000. This is about twice what it would take to put us in an ice age.” Kenneth E.F. Watt, in “Earth Day,” 1970. Remember before we were warned about global warming, we were told that the Earth was facing an Ice age. Granted, Obama is no fan of our close friends across the pond, but according to today’s news, England was still there. Maybe he was talking about the US Gulf Coast during the BP oil spill? Contrary to the hysterical nonsense being spewed by global warming experts, the past 50 years has been about the quietest on record for US hurricanes. The 1940s was the worst. Researchers at Florida State University concluded that the 2007 and 2008 hurricane seasons had the least tropical activity in the Northern Hemisphere in 30 years. This year there were plenty of hurricanes in the Atlantic, but they were generally weak and did not hit land. Pacific hurricanes were at a record low in 2010. 10. The Silly Stuff- Those Global Warming Moonbats figure out ways to blame the dumbest things on global warming. I call it the official crazy list of things Moonbats say global warming causes. The list contains, Incredible shrinking sheep, Invasion of jellyfish in the Mediterranean, Surge in fatal shark attack, Boy Scout tornado deaths, Severe acne, Global conflict, Beer tasting different, Suicide of farmers in Australia, Bigger tuna fish,Longer days, Shorter days, Collapse of gingerbread houses in Sweden, Cow infertility, UFO sightings in the UK, Rise in insurance premiums, and Heroin addiction and a rise in bear attacks in Japan and Frigid Cold Winters in Great Britain, and Cancer, Death from heart disease, diabetes, stroke, respiratory disease and even accidents, homicide, suicide,water -borne disease outbreaks,heavier, wetter snowstorms treacherous for travel and ambulation, Lyme disease, swarms of allergy-inducing, stinging insects, along with mosquitoes and devastating pine bark beetle infestations and the spread of forest and crop pests just to name a few.